Becoming a Young Woman is a unique trip for Journeys because it is not a backpacking trip. The seven girls who came on this trip did not struggle over miles of a trail. They did not experience the world from the top of a mountain. They did not get to enjoy the challenge of carrying all their own food and gear into the wilderness. 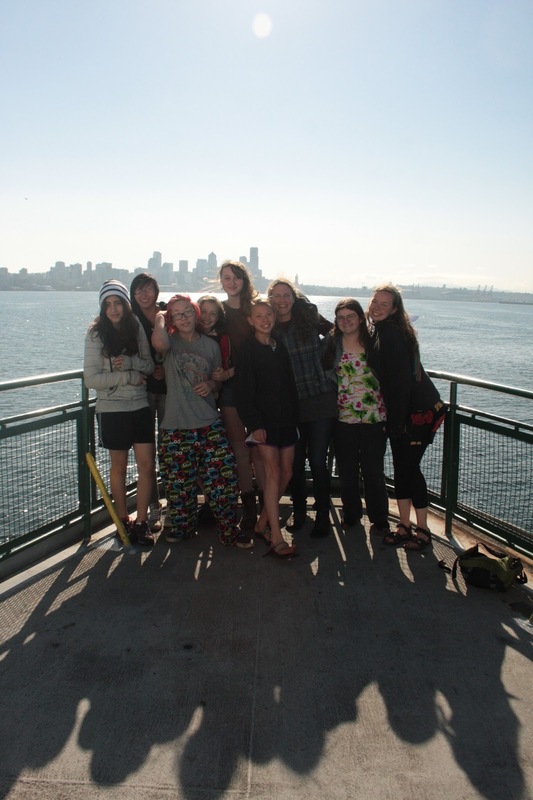 Instead, they spent a week at Sacred Groves, a powerful and nourishing retreat center in the woods and meadows of Bainbridge Island. And even though the girls of Becoming a Young Woman were not backpacking they were still on a journey--they still struggled, they still experienced "mountain-top" moments, and they certainly still had plenty to enjoy and plenty to carry. 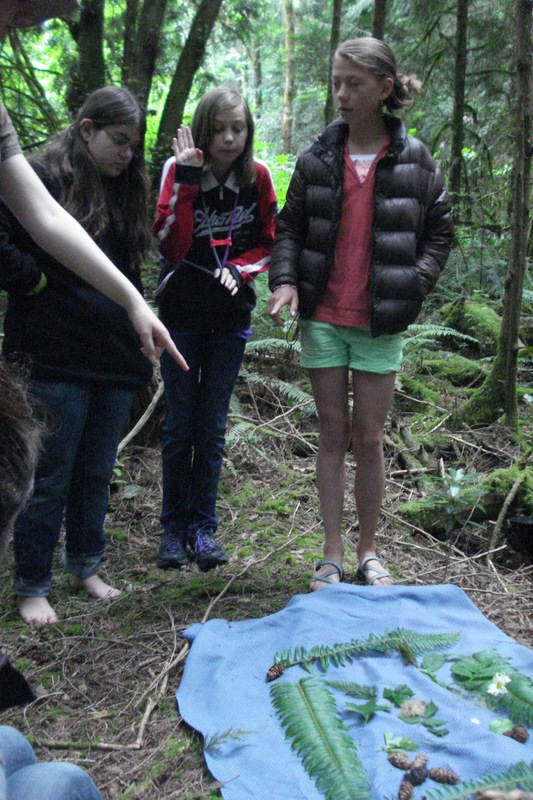 The girls enjoyed trust-building games and wilderness-awareness activities. They enjoyed sunny afternoons and dance parties in the Moonlodge ("In the Moonlodge! We're all dancin' in the Moonlodge!"). They enjoyed fires, story-telling, yummy food, and new friendships. What they carried were stories--good and bad, funny and scary, sad and uplifting. They carried stories about themselves and stories about each other. They carried stories about their childhood and stories about their future. They carried stories of their own lives and stories of people in distant and mysterious lands. They carried all of these stories, and each of them was different. The girls also carried masks--masks that had been shaped by childhood and parents, by shelter and by storm; masks that were hiding some things that wanted to be seen. By the time we arrived at Sacred Groves those masks were feeling cramped and uncomfortable, and weren't fitting so well anymore. And those old stories seemed strange in this new wild place, with these new wild people, who actually weren't like the stories had said they would be. On Monday, the first full day at Sacred Groves, the girls were joined by an elder--a basket-weaver and a story-weaver. 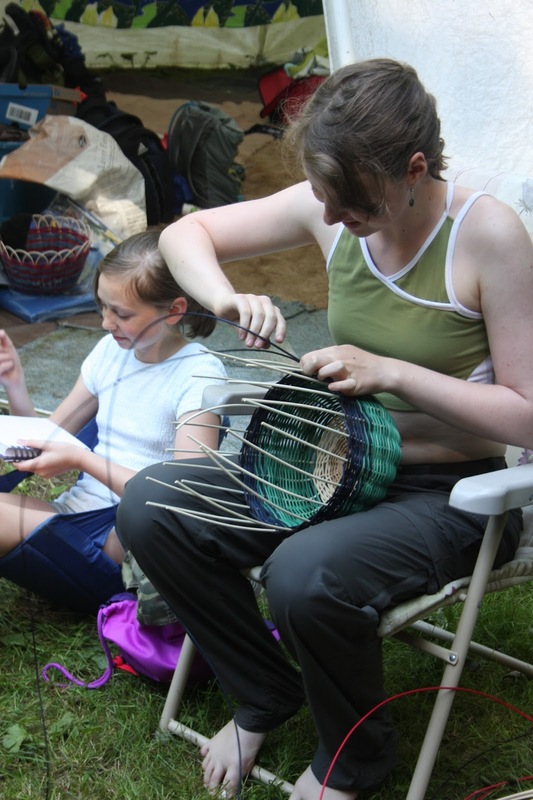 Kayla shared her weaving wisdom with the group, and then helped as each of the girls carefully crafted her own unique reed basket. 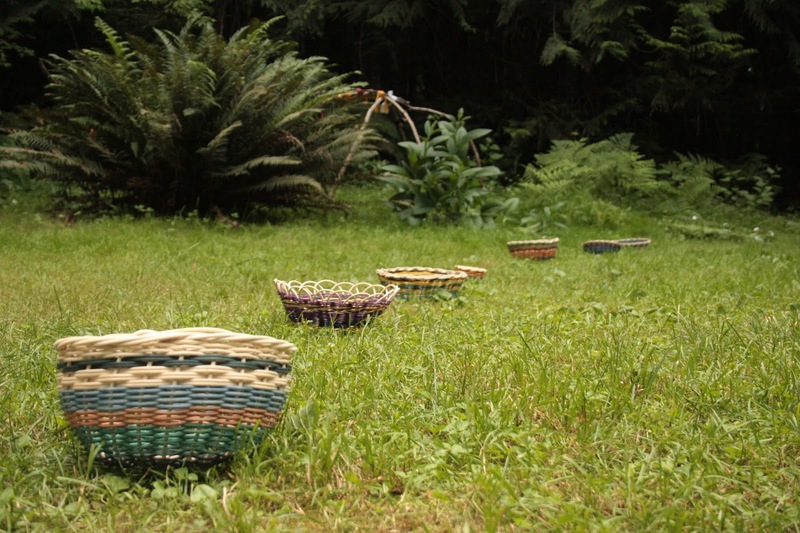 Each basket emerged differently--all different shapes, sizes, styles, and combinations of colors. Through their artistry, each basket honored the important stories woven into them. And it was clear too that each basket was made to carry something different. This is how our work begins. Take this dream and make it real!" 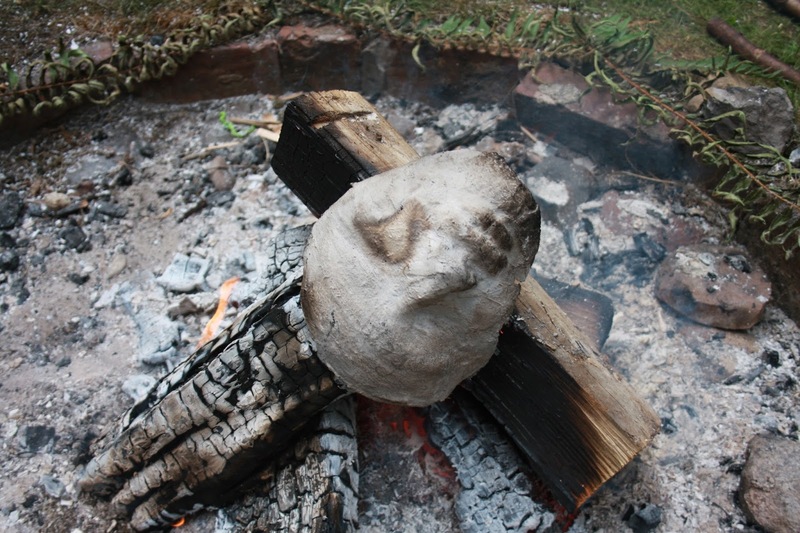 The next day, during the sweat lodge, the sharing deepened. The stories came out, the masks came off, and the intentions of each person began to weave into reality. Which stories would they carry into adolescence, and which would they leave behind? "Spiraling into the center, the center of the wheel. Spiraling into the center, the center of the wheel. Wednesday was almost like a dream. It was the day of the 8-hour solo-fast, and the girls stood around the fire in the misty morning, clutching their masks. One by one, they stepped forward and let them go, releasing the stories of childhood they no longer wished to carry. Then, one-by-one, they were led along a path of their empty baskets and crossed the threshold to the woods where they would go, alone. Eight hours later, around the same fire, we welcomed back 7 young women, each with a brightly-painted cast of their face, shining boldly with intentions for what they will carry in adolescence. The baskets that had been empty now carried of gifts for remembering and celebrating the freedoms and responsibilities of this new stage of life. And celebrate they did! The group enjoyed a relaxing evening and then a wild night of sweet treats, dancing, being goofy and letting loose together, beading necklaces and telling stories. 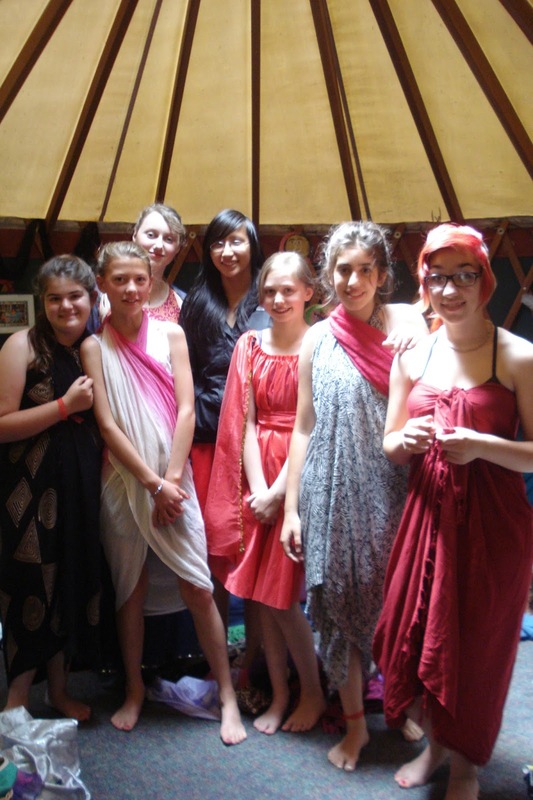 The celebrating and fun continued the next day as the group spent the morning doing each other's hair and make-up in preparation for the Maidenhood ceremony where they would be honored and witnessed as young women. And after the ceremony there were even more treats and dancing, and (finally!) on Friday we all got to go to the beach to swim and play before heading back to Songaia the next morning. Sound like a whirlwind? It was! But it was also timeless. "I think when we're in our day to day lives, we really forget who we really are. All of the technology and mindless babble going on around us, it's hard to really concentrate on who we really are. But when you get the chance to spend so much time alone with yourself... It's truly enlightening. You get the chance not only to remember who you are, but to discover who you aren't as well. You can see your strengths and weaknesses clearly. You know your flaws, and you can see your own beauty. And you get to understand how you can change yourself for the better, so that the person you've always wanted to be can become the person you know you truly are." All seven bold young women took this journey to uncover and remember who they are and want to be, and began to weave that truth into something they can carry with them as they move forward in their adolescence. Phew! We've just returned to sunny Songaia after three weeks of journeying through the wilderness of the Olympic Peninsula, and questing through the wilderness of our hearts. 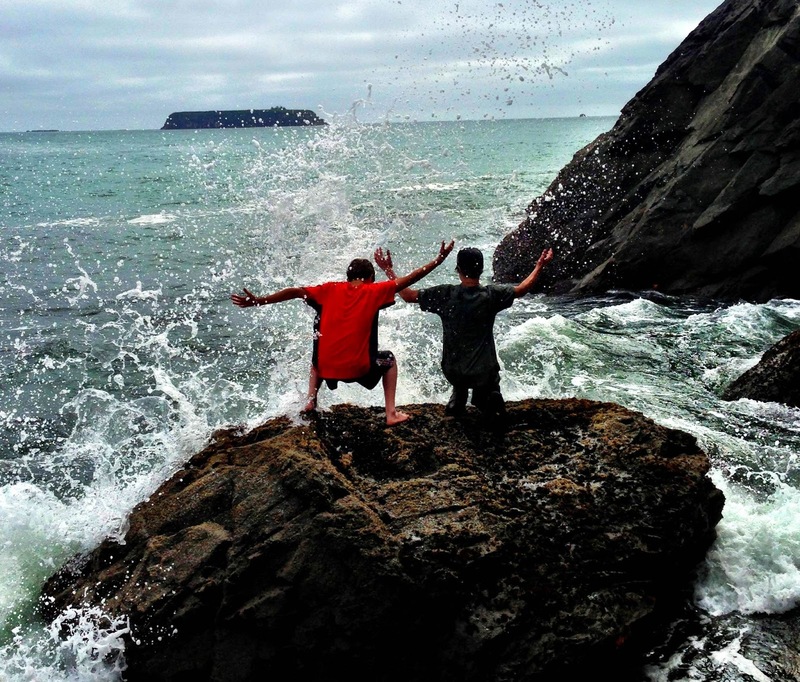 Seven boys and four guides set out to undertake the journey between childhood and adolescence. We've braved glacial rivers, torrential downpours, and invasive sand, seen black bears and eagles, and each grown through the fires and blessing of traveling through the wilds with a group of fellow seekers. Below you'll find a glimpse of our journey, written by the boys on one of their final days. Enjoy! During this trip we did a lot of hiking. 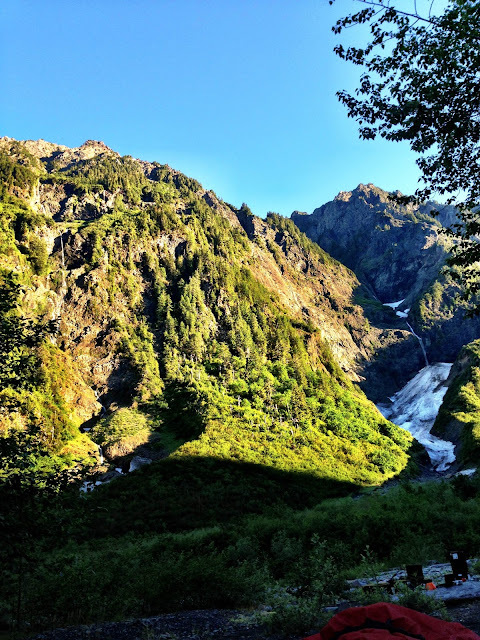 It started off really hard between the heavy packs and the very treacherous trails, but as the journey progressed and our muscles grew, our packs got lighter, the trails became easier, and hiking overall was tolerable. We woke up early in the morning to start hiking and that did nopt help hiking being enjoyable. The weather everyday affected our moods towards hiking. In the beginning, it was very sullen and rainy, but over time the sun came out and our moods started to brighten. Though the hiking was not fun, the sense of accomplishment of finishing a trail or getting to an awesome view made it all worthwhile. The group poses in front of the largest Sitka spruce in the world! Enchanted Valley was very beautiful. We really liked waking up in front of waterfalls and amazing mountains. We went on a day hike and it was very fun. We were stopped halfway through because the waterfall had broken the bridge across. Instead, we went to the river and had lunch. Overall, we think enchanted valley was very "enchanting". The beach was a significantly different experience from the woods. 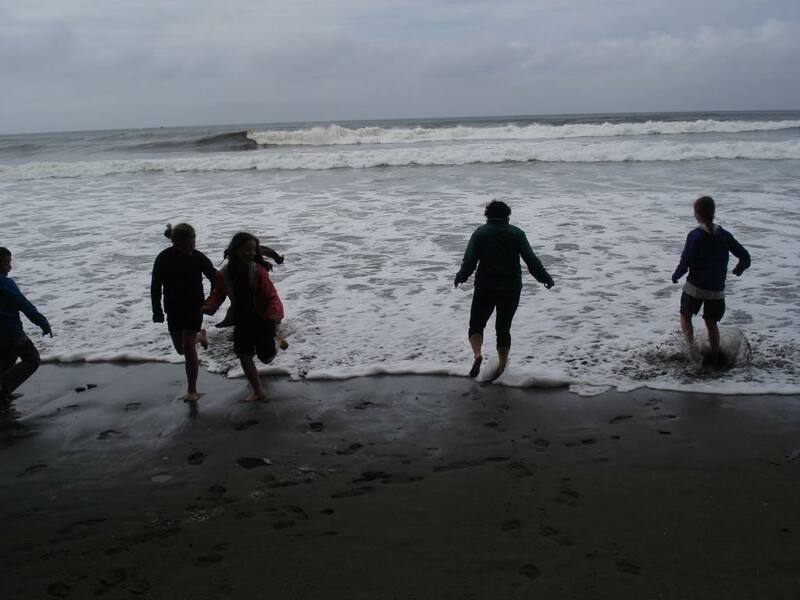 First of all we would fall asleep to the sound of crashing waves instead of rushing river. The sand got everywhere which was annoying! It was a lot harder to hike on the and and it was a lot colder because of the ocean breeze. Overall, it was harder but still fun. The solo was the most challenging part of this trip. We started very early in the morning and it was extremely cold. It got worse as the day progressed. It got colder and we got hungry. There were fresh muscles in the water that we could have cooked but out of a sense of duty, we agonizingly refrained ourselves. As the day grew longer and colder, we started to get very bored and lonely. We started to become into a state where we were growing emotionally and the whole days was physically and emotionally straining. When we got back we ate oranges that tasted like heaven. 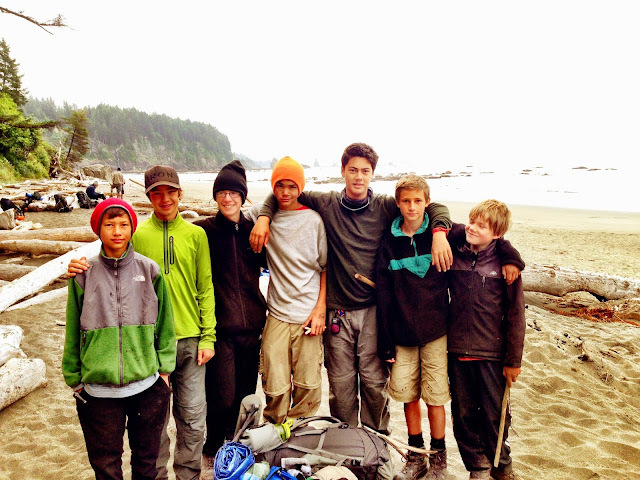 The call to adventure of June 2013 brought together 9 intrepid explorers and three adventurous guides. We started off our first day getting to know each other on a long drive to the Lake Ozette Campground. 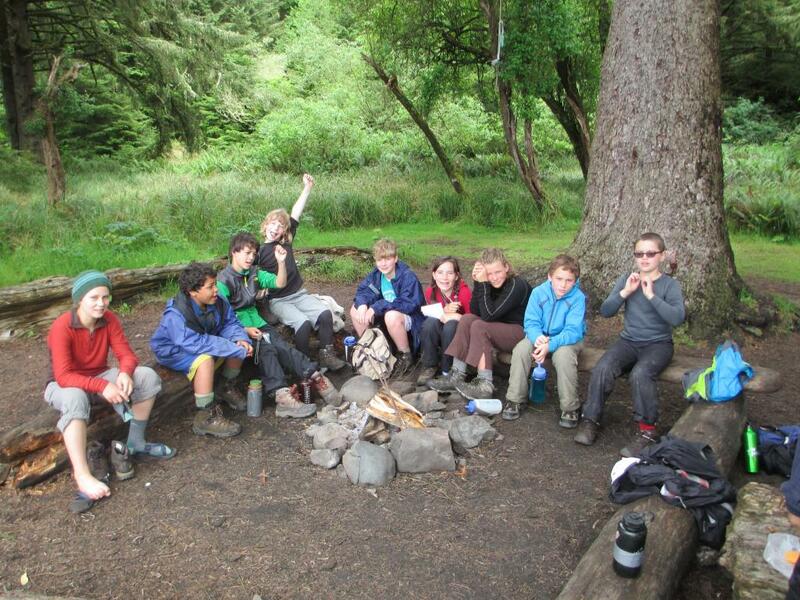 The group arrived with the rain and quickly learned basic fire making skills. A hot dog roast warmed bellies and eased the transition into the new group life experience. In the morning the group discovered the salmonberries surrounding our site and this added a tasty distraction during the preparations to hit the trail. There remained an air of uncertainty in the group as we loaded and adjusted our gear and packs and even as we approached the trail. However, once we were off the laughter and riddles began. 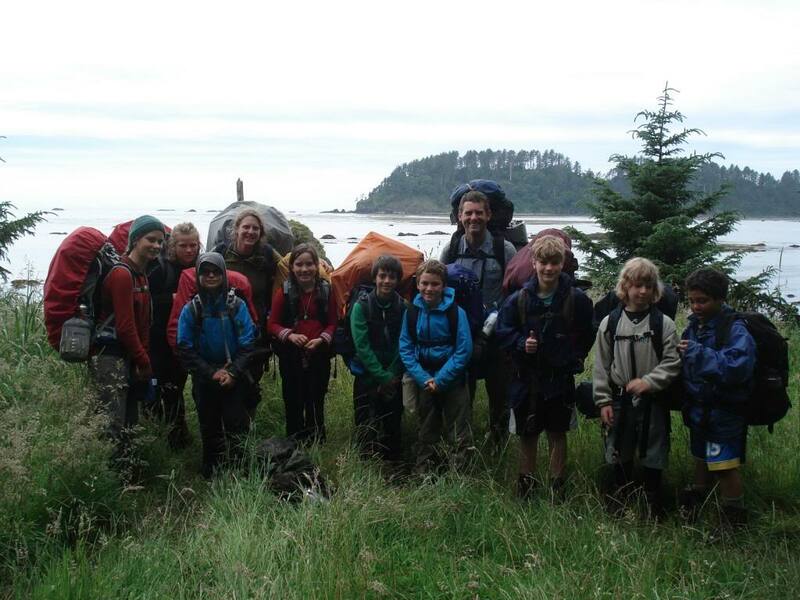 Hiking though the old growth forest to the coast turned out to be an easy first day for this group and we were eager to explore the beach at Cape Alava, our first camping site. We watched the tide roll in as we set up camp and prepared dinner. Bird alarms warned us of an intruder and we caught site of a raccoon in a nearby tree. Later we watched the raccoon sneaking around camp and investigating our bear cans. We held our first council that night creating a safe container to share and learn about our selves and to connect to each other on a deeper level. The next day was our layover day. At low tide we explored the tide pools all around Cannon Ball Island. We played games on the beach, which were the highlight of the day for much of the group. The afternoon included awareness exercises and activities designed to help us connect with the natural world. We noticed dozens of great blue herons wading in the tide pools. Then we had a sit spot along the beach, which allowed us to watch and then experience a heavy rainstorm rolling in. The rain was truly our partner in this adventure. It rained some (or a lot) every day. That evening students learned that they could put together a skit for the reunion with their parents, and the preparations began immediately. 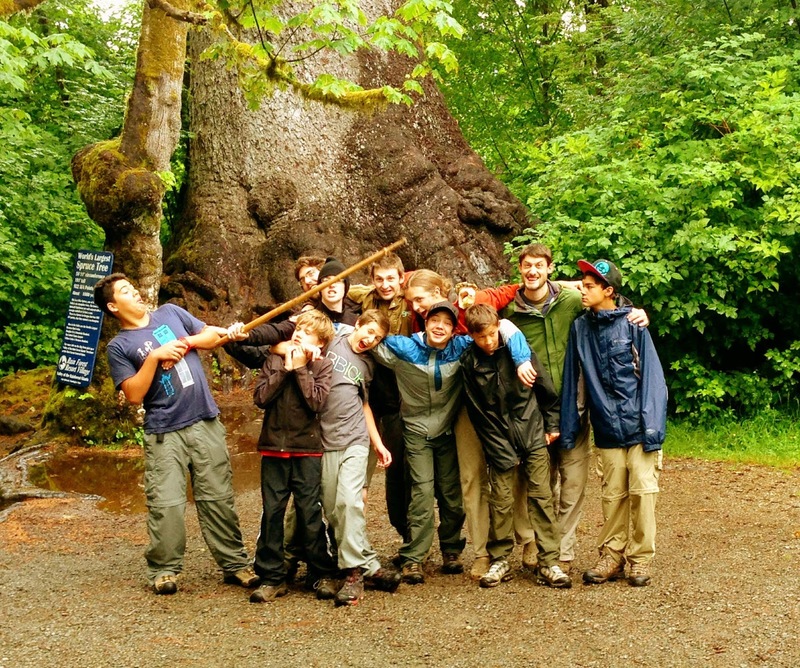 Each day during the trip they practiced and performed new uproariously funny skits about life in the backcountry. The tides were a significant obstacle this trip and we had to make an early start the next morning. 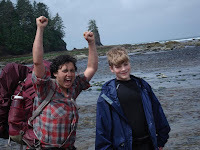 Our goal was to head north and cross the Ozette River in the morning at low tide. We made it across the swift, ankle-high current and arrived at an extremely beautiful campsite. With the culture of leadership roles established camp was set up quickly. When firewood collection was thwarted by high tide we were reminded of how beautiful the ocean scene was. 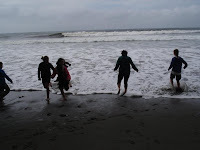 After a time of sitting as a group watching the waves and the seals, we ran with laughter and glee to play in the ocean waves. We saw the ocean push back against the river causing her to rise higher and higher. We transitioned to playing in the river and watched a river otter swimming and chattering just a few yards a way. Then we relaxed, warming ourselves on the beach rocks. During our after-dinner sit spot on the beach and we saw the clouds break and we got our first glimpse of the sun as it began to get low in the sky. Thought it rained much of the trip, the next day it really rained. And it rained. And it rained some more. We had a tough morning getting going and a tough hike along the coast. The sight of ravens flying off brought our attention to a seal carcass. We marveled at the whiskers, flippers, size and overall beauty of this animal, and then we noticed the eagle tracks in the sand. 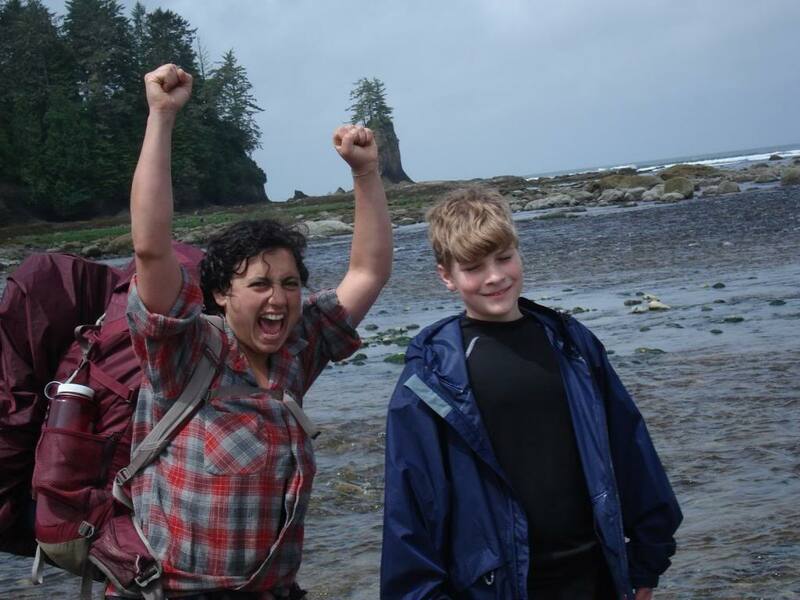 We made it back to Cape Alava. But when we tried to push on further south to our goal of Wedding Rocks, we were stopped by the high tide and couldn’t go any further. And so we decided to stay at Cape Alava again. In moments the adventurers had their tarps set and were underneath warming up in their sleeping bags, joking and laughing. 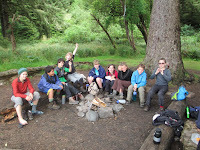 It was amazing to see how quickly this group learned new skills, and adapted to the environment and each other in creating a nurturing group experience. After dinner we sat around the fire and took turns telling stories of significant events from our lives and it was clear the safety and bonding each of us felt in that moment. The next day was mostly dry and we hiked to wedding rocks to look for petroglyphs. The group was high energy this day and moved quickly all day. 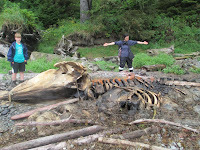 We had heard of a whale carcass from other hikers and found it. We guessed it to be 20 feet long and that was only the pelvis and some of the ribs and vertebrae. It was amazing to see the skeleton of an animal whose ribs were taller than any one in our group. Further down the beach the group also stalked up close to observe a mule deer walking the edge of the beach and grassy slope. 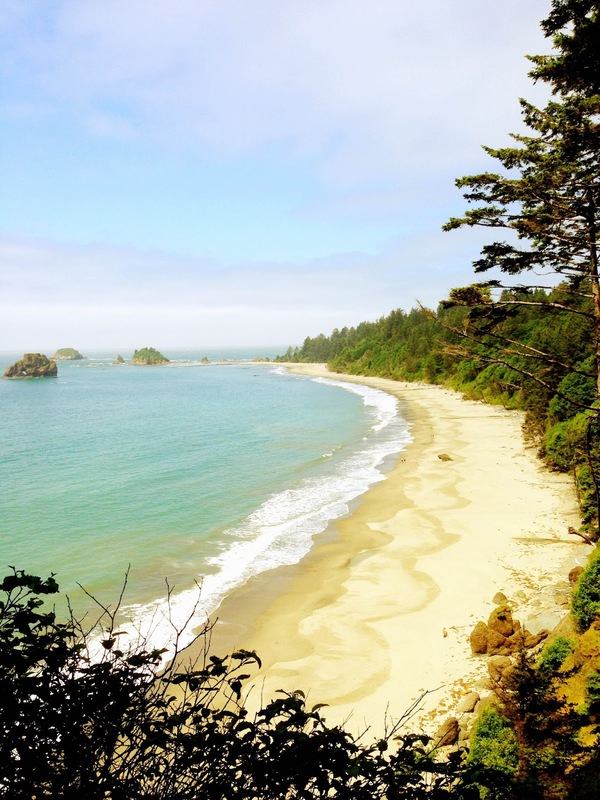 After singing our farewell to the ocean we hiked back through the forest to Lake Ozette. The laughter and singing of the group could be heard throughout the campground that evening and in the morning as well. We had all grown through the challenges, responsibilities, and by connecting with each other, the natural world, and ourselves.